How to Set Up a Shopify Integration – How can we help? We recommend setting up a new register in Vend in the outlet you want to link to Shopify. This is because sales made in Shopify after you close your store’s register for the day will re-open the register. Setting up a separate register ensures all your reporting is clear. For Vend users on a Pro or Enterprise plan, your ecommerce register is included for free. Contact our team to get this set up. Make sure you have set up all the products you need before activating the integration. When you first turn it on, you'll have an option to push all your products to Shopify. After this point, you'll need to push them one-by-one. We also recommend you take a back-up of any product data in either system before you begin. You can export your Vend products on the Product page and you can export your Shopify products on their Product page. For Vend users on our latest pricing plans, the Shopify integration is available on the Pro or Enterprise plan. If you’re on the Lite plan you’ll need to upgrade your plan in order to connect your Vend store to Shopify. A Shopify account. You can sign up here. Your store URL, and your login credentials. 2. Find the Shopify add-on, and click Add to Vend. 3. Input your Shopify store URL. If you have your own domain (e.g. mystore.com) make sure you tell us your Shopify domain (e.g. mystore.shopify.com). Click Save. 4. If you're not already logged in to your Shopify store, you'll be asked to enter your Shopify log in credentials. If ALL your products are in Vend, and you want them ALL in Shopify, click Publish ALL to Shopify. If ALL your products are in Shopify (existing Shopify user), click Import ALL from Shopify. Note: Any pictures attached to these Shopify products will not be carried across to Vend. If you have products in BOTH systems, please contact our Support team. If you only want to publish SOME of your Vend products to Shopify, select Manage products manually. Note: Selecting Manage products manually will take you to your product page to publish individual products. These can be published by clicking the grey Shopify logo. You will need to return to the Shopify settings page in Vend to complete your setup when you finish. 6. Choose which register you'd like us to record Shopify sales on or set up a new one specifically for Shopify. Important: If you have more than one outlet you'd like to link with Shopify you will need to setup multi-outlet inventory. To do this, follow these steps. 7. Choose the payment type you'd like us to record your payments on. This could be your normal credit card type, or you might like to set up a separate payment type just for Shopify payments. Important: Vend gift cards do not work with Shopify. Shopify has a Product Vendor field. This field is shown on your Shopify webstore. 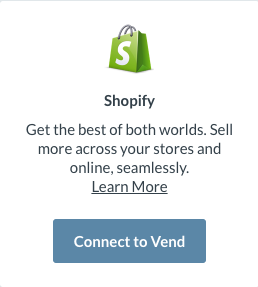 By default, your sales in Shopify will automatically be added to your Vend store, and update the available inventory. If you do not want your sales to appear automatically, untick this box. This means your Shopify orders will only appear in Vend when you manually add them using the Get Shopify Orders button. Important: If you set this to off, and later turn it back on, you need to make sure you manually pull any final orders through. Important: Do not unlink and re-link your stores unless you're planning on deleting all items from your Shopify store and starting from scratch.